This species is accepted, and its native range is Central & E. U.S.A. to Honduras, Caribbean. Perennial. Culms erect; 15-30 cm long. Lateral branches ample. Leaves heterophyllous with a basal winter rosette. Leaf-sheaths glabrous on surface, or puberulous. Ligule absent. Leaf-blades lanceolate; 2-5 cm long; 3-6 mm wide. Leaf-blade surface glabrous, or puberulous. Inflorescence a panicle. 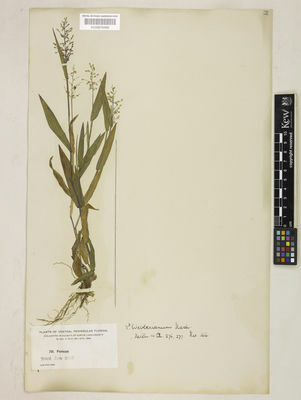 Panicle open; oblong; 2-4 cm long. Spikelets solitary. Fertile spikelets pedicelled. Spikelets comprising 1 basal sterile florets; 1 fertile florets; without rhachilla extension. Spikelets obovate; dorsally compressed; obtuse; 1.5-1.6 mm long; falling entire. Glumes dissimilar; reaching apex of florets; thinner than fertile lemma. Lower glume ovate; clasping; 0.33 length of spikelet; membranous; without keels. Lower glume apex truncate, or obtuse. Upper glume obovate; 1 length of spikelet; membranous; without keels; 7 -veined. Upper glume surface puberulous. Upper glume apex obtuse. Basal sterile florets barren. Lemma of lower sterile floret similar to upper glume; elliptic; 1 length of spikelet; membranous; 7 -veined; puberulous; obtuse. Fertile lemma elliptic; dorsally compressed; 1.5-1.6 mm long; indurate; without keel. Lemma margins involute. Palea involute; indurate. North America: eastern Canada, north-central USA, northeast USA, south-central USA, and southeast USA. South America: Mesoamericana and Caribbean. Paniceae. Man US Grass 2004. Panicum heterophyllum var. thinium (Hitchc. & Chase) F.T.Hubb. Panicum nashianum var. patulum Scribn. & Merr. 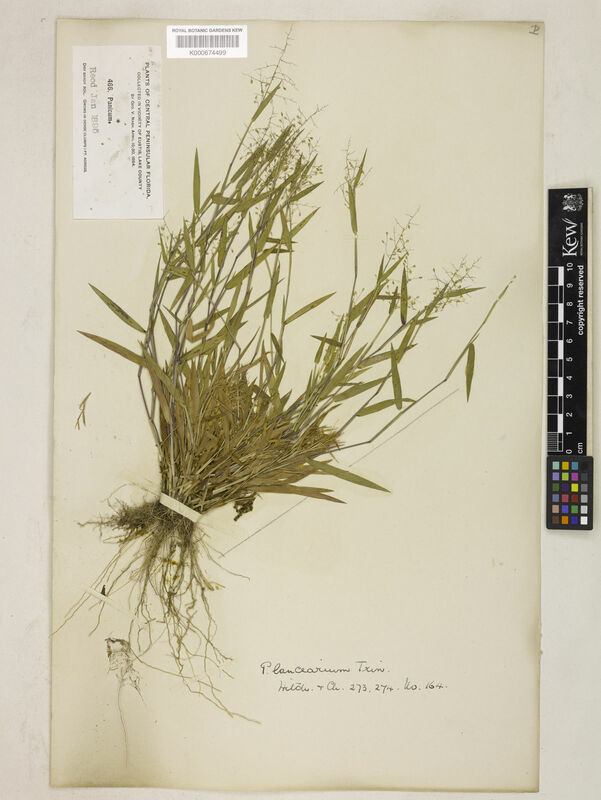 Panicum patulum (Scribn. & Merr.) Hitchc.